In the past decade memes have become the most important influence on many of our lives. 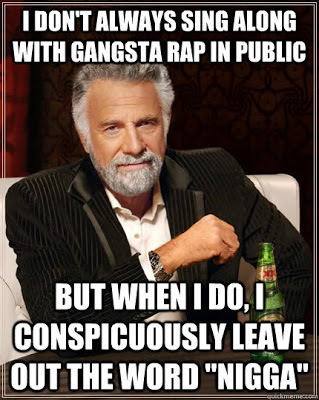 From the day we sat in the computer lab in high school watching the "All Your Base Belong To Us" viral video to early this morning when you woke up and your partner showed you Psy's "Gangland Style," these memes/videos now form the totality of the human experience. When something from "real life" becomes a meme, it is like god reaching his big, black, tattooed arm down from heaven and blessing it. That's why I will attempt to do positive, goal-oriented reviews of all the memes currently making their rounds on the internet. If you ever have any suggestions, please post them in the comments or simply produce a viral meme that enters my cyberworld through the 15 friends I have on Facebook and the LoveShy message boards I visit daily. This meme is based on a commercial. People who drink beer, especially beer that runs about $3-$4 in small towns, are very refined consumers. You can't just put on a picture of a beautiful woman, her grotesquely obese husband and play a soft rock song in the background and expect them to lap up your inferior beer product. So Dos Equis, the Spanish beer that means "W" en Español came up with a commercial loosely based on the Chuck Norris jokes. 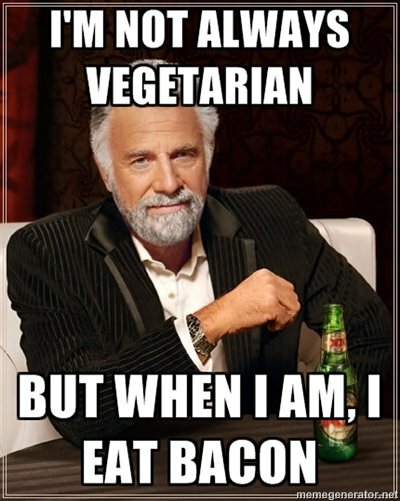 The guy in the commercials has a white beard like Santa and says things in a cool smooth manner, finishing off the series with "I don't always drink beer but when I do its Dos Equis." When someone figured out you could turn this commercial into a meme, the internet cheered! The prevalence of these pictures really took off around the time of the Arab Spring as the people of Egypt and Libya found them a useful rallying cry. 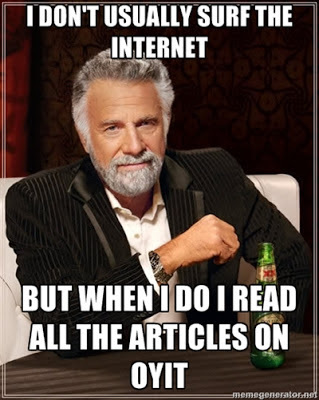 Some writers on World Net Daily say the Dos Equis meme is what led to Mubarak's ouster but other writers on World Net Daily say Marriage Equality, Like Slavery, Leads to 'Moral Chaos.' 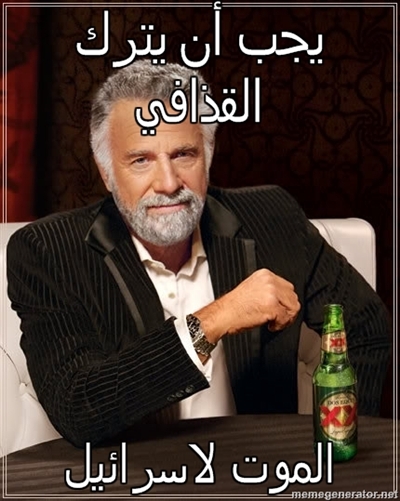 There is no way to know for sure the role Dos Equis meme played in the Arab Spring but it is the meme most often translated into Arabic based on a study by the Muslim Brotherhood's think tank. The following are the top five examples of this meme I found on the internet after an exhaustive 45 second search. 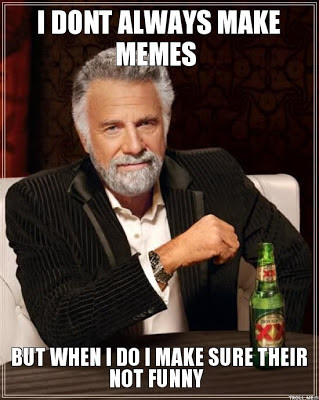 All are up for "Meme of the Year" 2011 at the Internet Awards this November. 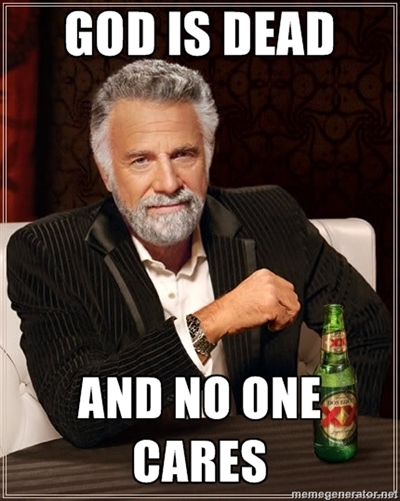 I award the Dos Equis Meme a 6 OUT OF 10. Thank you Dos Equis man and thank you readers and thank you internet for making this meme possible. Please comment with what you want the next meme review to be! Great start to this series. I'd love to see the Willy Wonka one next. Please delete this post immediately. It violates a number of provisions in the UN meme accords!